MESH tags can collect and send certain types of data. For instance, you can program MESH Temperature & Humidity to send a notification of room temperature to your device. Follow the steps below to learn how to create a recipe using the notification feature. Many MESH tags can collect and send data (see table below). The Notification tag can be used to send data as a notification to your device, as an email in GMAIL, or to If This Then That (IFTTT). Sample Recipe: Receive a notification of the temperature in a room when you press MESH Button. Drag the following tags onto the canvas in the MESH app: "Button," "Temperature & Humidity," and "Notification." Connect "Button" to "Temperature & Humidity"
Connect "Temperature & Humidity" to "Notification"
Image: Connecting MESH Button, MESH Temperature & Humidity, and a "Notification" tag in the MESH app. Once the "Temperature & Humidity" sensor tag is connected to the "Notification" tag you can begin to receive notifications. Next, choose the type of data and text you'd like to send using the notification tag. Select the "Temperature (° C)" data type on the Temperature & Humidity tag. 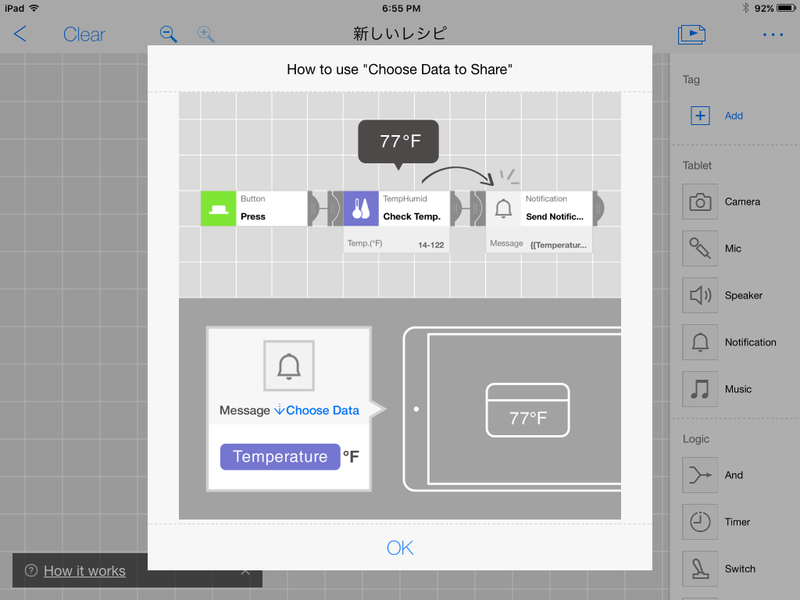 Edit the "Send notification" text to include a custom message with the temperature data. For example: "The current temperature in the baby's nursery is 22°C (73F). Image: Example of settings in the Notification tag in the MESH app. These settings will send a notifications of the temperature as detected by a MESH Temperature & Humidity tag.